This was my fifth biking trip to Markleeville in the California Sierra-Nevada over the last three years and the best weather-wise. The conditions were perfect for cycling (mid-70s) under clear blue skies during the day and ideal for camping at night (high-40s). Unfortunately, my wife could not join me for this last minute trip and I could have spent some time in the dog house upon returning but she's understanding. 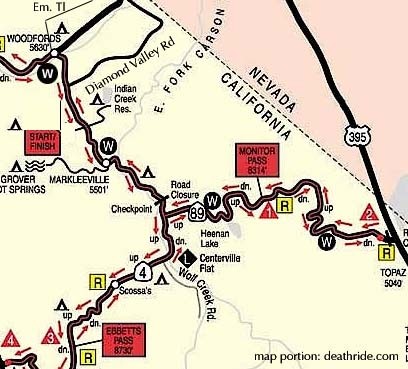 The routes I rode are part of the infamous Death Ride held each July in hot, dry, high elevation conditions, which features 2600 riders attempting 129 mi and 15000+ feet of climbing. On Saturday, I rode up to Ebbetts Pass and Monitor Pass for 64 mi and 8000' of elevation gain. CA#4 was closed to cars beyond the halfway point up to Ebbetts Pass since it was not yet completely clear due to the large winter snowfall. It was fine for cyclists and we had an exclusive on Ebbetts during this perfect weekend! On Sunday, I rode a double Monitor Pass out to US395 and back for 62 mi and 7500' of elevation gain. On Monday, I rode north looping around Diamond Valley Rd and Emigrants Trail for an easy 35 miles. I started all rides from Grover Hot Springs State Park campground, the finest state park campground that I know of in California and listed in Best in Tent Camping Northern California. Also, consider one of the few motels in Markleeville - J. Marklee Toll Station Motel. Snowbanks started about halfway up. In fact, CA4 was CLOSED beyond this point to cars. Once posted please notify us with a link to the photo(s).